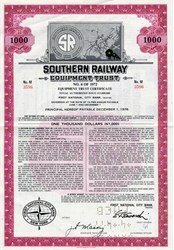 Beautiful certificate from the Southern Railway Equiptment Trust issued 1972. This historic document was printed by the American Banknote Company and has an ornate border around it with a vignette of the railways in a U.S. map. This item has the printes signatures of the Company’s Trust Officer, and Associate Trust Officer, and is over 40 years old.